Late for my meeting, I didn't have a car today. I had to walk 1.5 miles to get to the car rental place, but being lazy, I decided to take the bus. When I got out of my place, it was partially cloudy, and a little chilly. I wish I had taken my jacket, but I was late so I rushed. I got in the bus and it stopped 3 blocks from where we started and there were no signs of further movement. This is common in the LA Metro bus. Sometimes they stop in the middle of the way to change bus drivers. Only this driver, seemed pretty frustrated and confused. I went up to talk to him and he said we were to take a detour. On his screen, it said he had to turn right Manchester, but Manchester was the street that was closed. So he was waiting for his supervisor to send him the new directions. If I had walked, I would had been more than half way by now. So I decided to get out. Typical Los Angeles weather, it was now a beautiful warm sunny day. 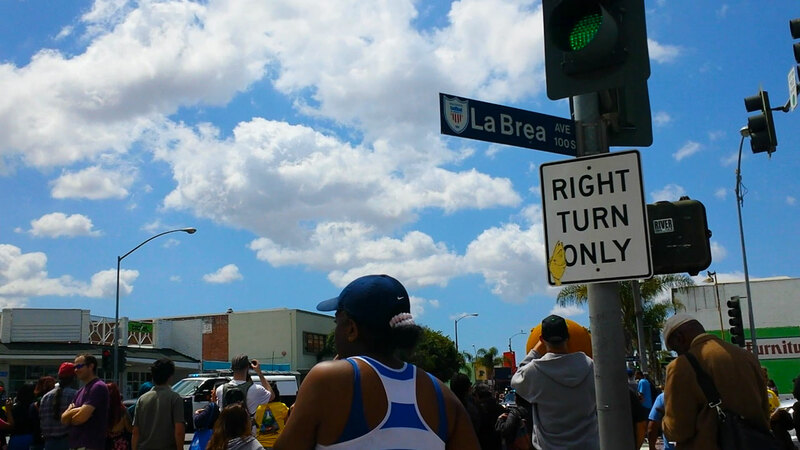 Only a block ahead, I could see the streets blocked, and an immense crowd. Police cars everywhere, my hear sank. I thought something bad had happened. What the Hell is this? Download full res. My first thought "What did Donald Trump do!" But the closer I got, I realized what it was. This was a beautiful surprise to appear right in my neighborhood... despite the traffic it caused. 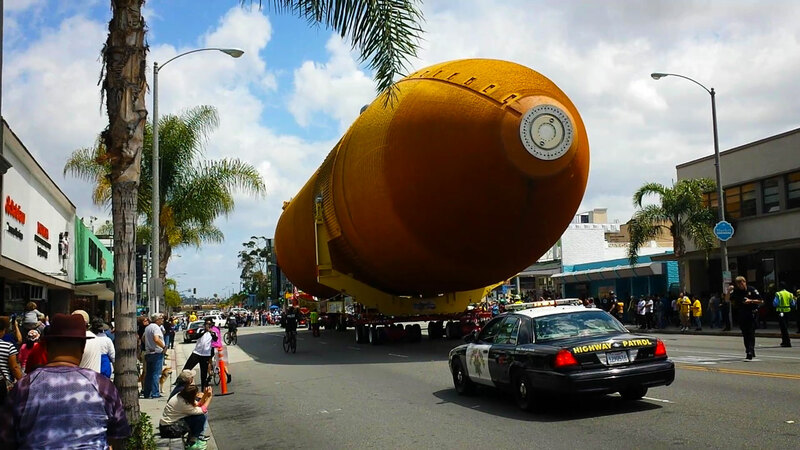 ET-94 started rolling down the streets, and the crowd was getting more and more excited. 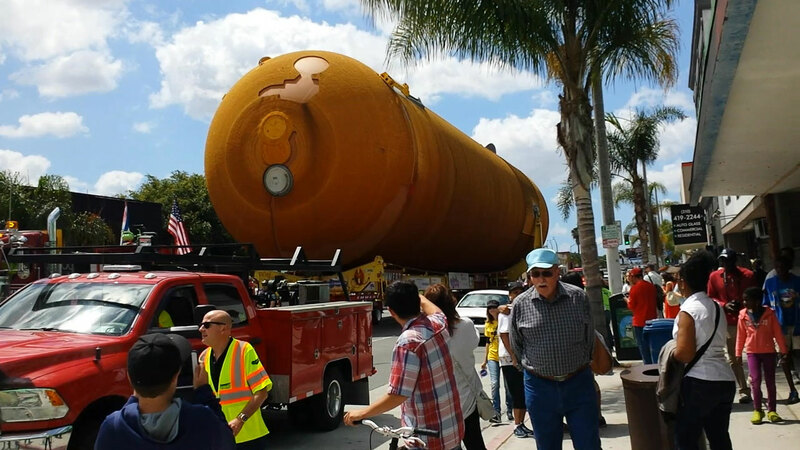 This was a 66,000 pound space shuttle fuel tank rolling down the streets of Inglewood. 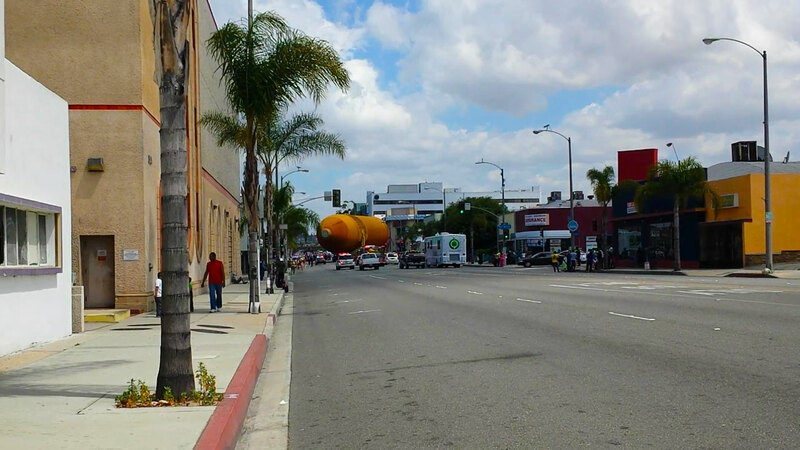 In 2012, A similar event occurred and I was lucky to be working in a building in the corner of Sepulveda and Imperial. It faces LAX's landing strip. 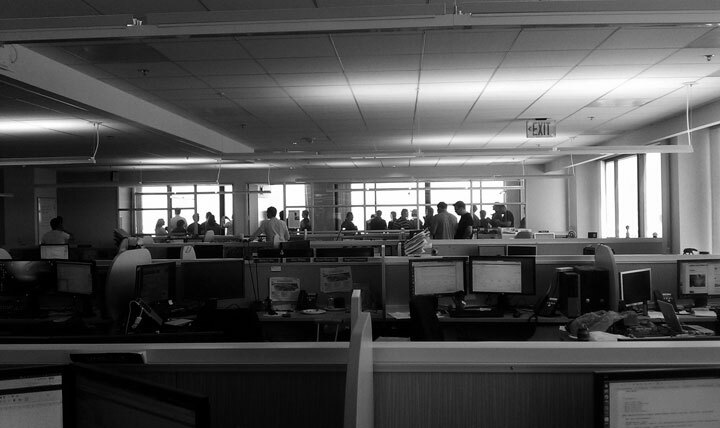 One September 21st, I suddenly saw all my coworkers leave their stations and run to the north side of the building and stick their faces to the window. I too joined and stuck my face on the large Window. 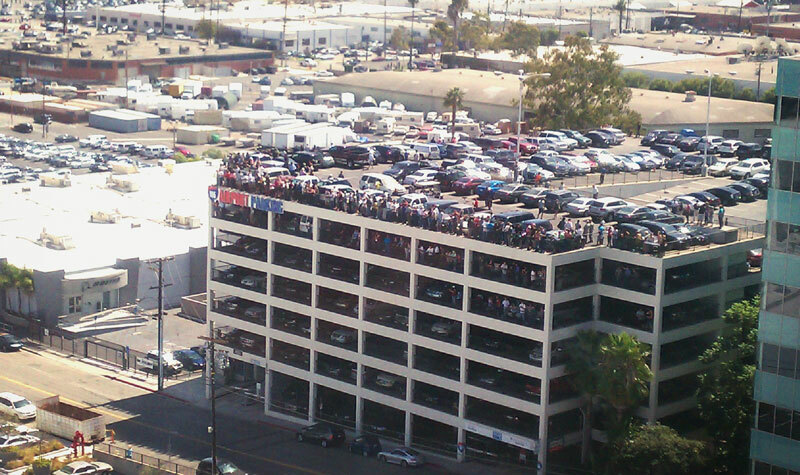 Down the street, there were people who decided to park their car right on the freeway. 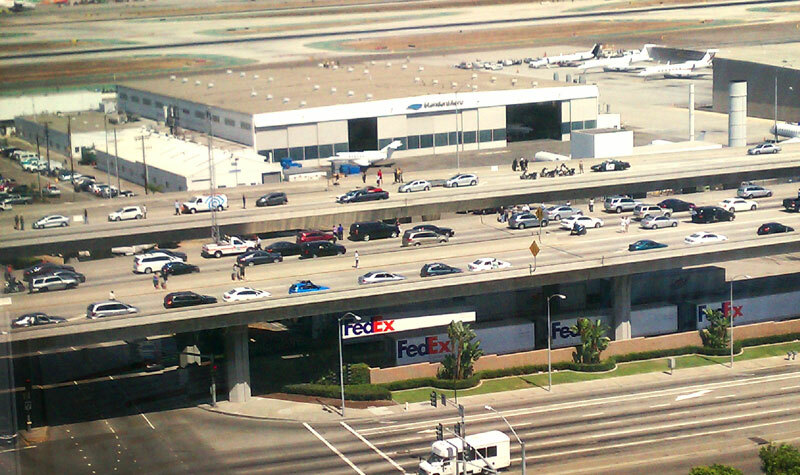 Highway patrol officers stopped, and joined them at looking over the airport. I don't think there was any prior agreement, people just did it. 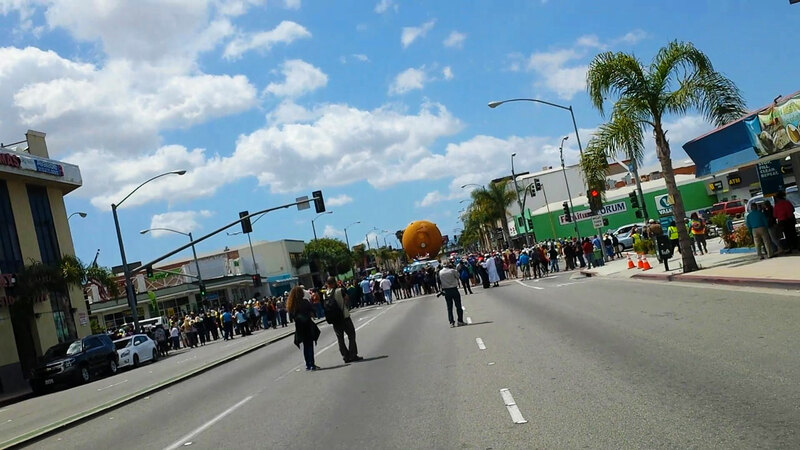 Families joined and all of the sudden the freeway was packed with people. In the sky was the most unusual of plane. Well planes. OK. A plane carrying another plane. 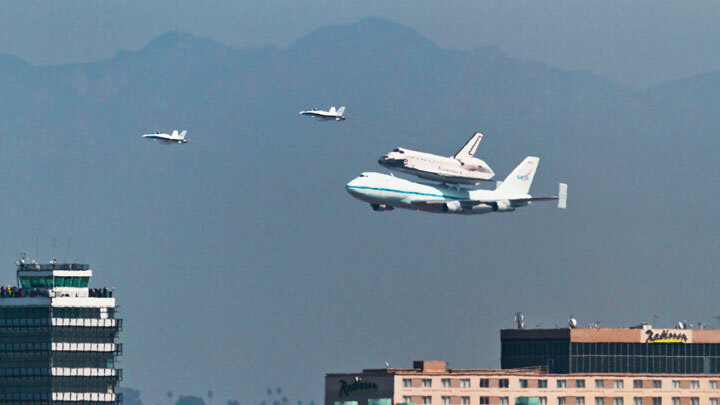 Well to be correct, a plane carrying a space shuttle. I had a pretty bad camera phone so you'll settle for the flickr picture of Endeavor making its final landing right here in LAX.